Pictured from left to right Matt Boenig, RN; Carol Michaud, RN; Cassidy Bordes, RT; Amit Amin, MD and Jenny Johnston, RT. 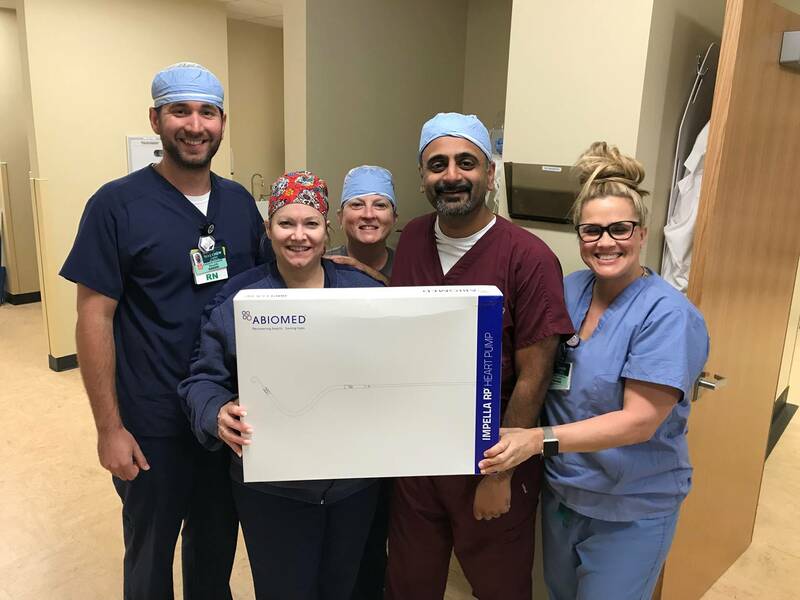 LAFAYETTE- Dr. Amit Amin, interventional cardiologist at Cardiovascular Institute of the South (CIS), is the first in Lafayette to perform an implant of the Impella RP®, the only percutaneous heart pump approved for right heart support. This minimally-invasive and life-saving procedure took place on April 6 at Lafayette General Medical Center. The Impella devices temporarily assist with the pumping function of the heart during a high-risk coronary intervention. The Impella RP® heart pump specifically is designed to provide the flow and pressure needed to compensate for right heart failure. It is delivered through a catheter requiring only a small incision in the leg, and it provides more than four liters of blood per minute for hemodynamic support. Click here to find a CIS location near you.